I don’t know about you, but paper is both my best friend and my worst nemesis! I love, love, love paper and can’t ever imagining having too much of it, much to my husband’s dismay! So, I need to keep all that lovely paper under control, or it will overwhelm my entire crafting space. 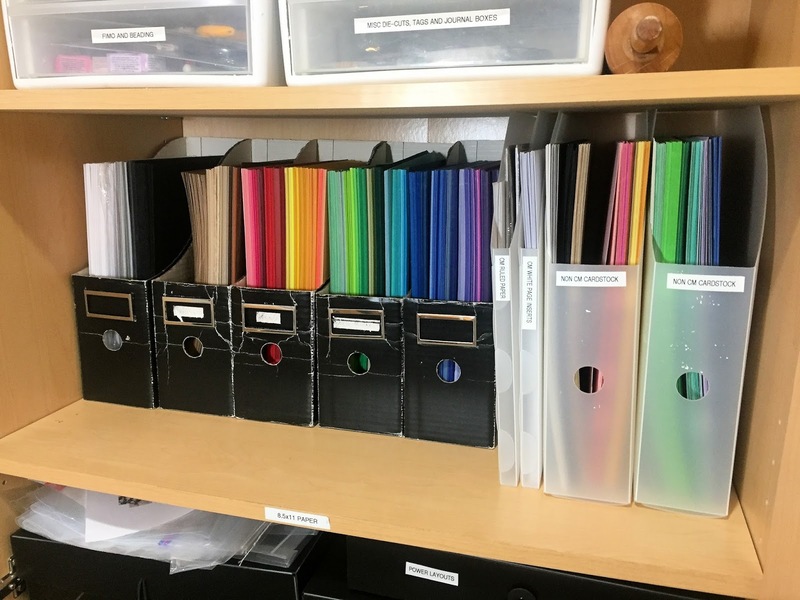 A few things you need to know about the way I think – I keep collections together, I think about things alphabetically, and I like to arrange colors in rainbow (ROYGBIV) color order (blame it on my art teacher background.) 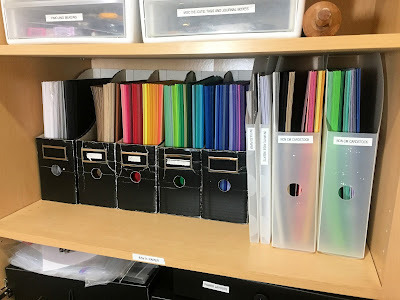 Knowing this, let me share my tried and true methods organizing and storing paper that work for the way I think and plan, my creative process AND for running my small CM business. 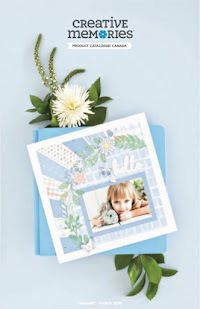 Creative Memories Collections: Because I sell, write about and design with Creative Memories products, I like to keep them together in their collection – paper, stickers, embellishments, slide-in cards and Fast2Fab pages if applicable. This way I always have all the elements together when I go to create a layout or project. 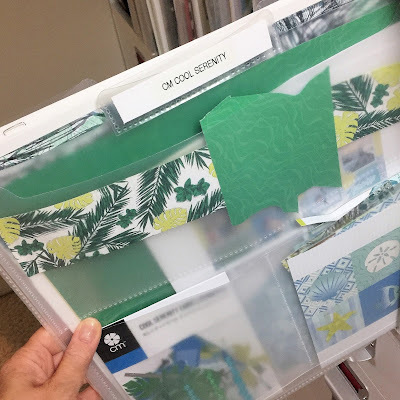 If I use a specific color of cardstock with the collection I’ll also place any scraps in with the collection for future use. I keep each collection in a Power Palette Folder or the large zip-bag they come in, and stand them along the top level of my cube wall. The dividers in the cubes help to keep them organized and not sliding down. 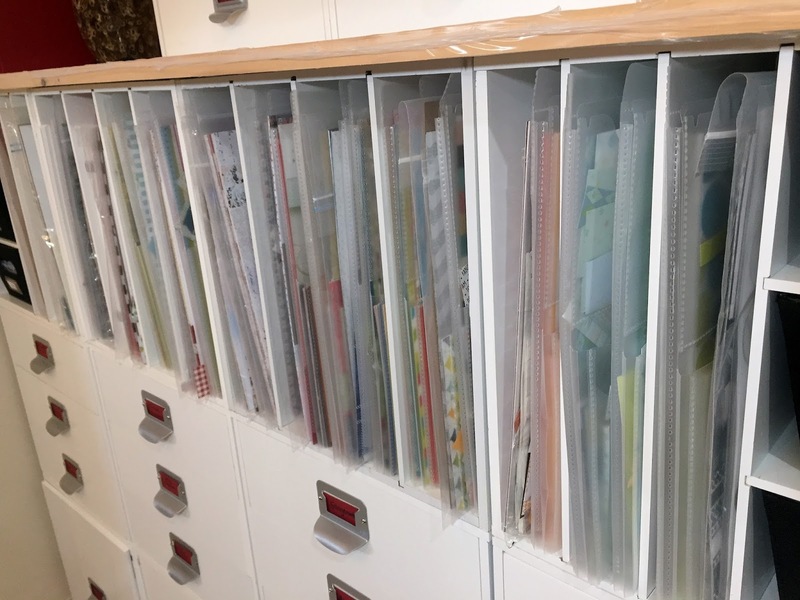 I also label each folder or bag and sort them alphabetically by collection name. Although this sounds like overkill, I can find the collection I’m looking for in a matter of seconds, which really maximizes my crafting time. Other Brands of Patterned Paper: I love paper from other companies as well…Close to My Heart, Echo Park and Bo Bunny are among my favorites. 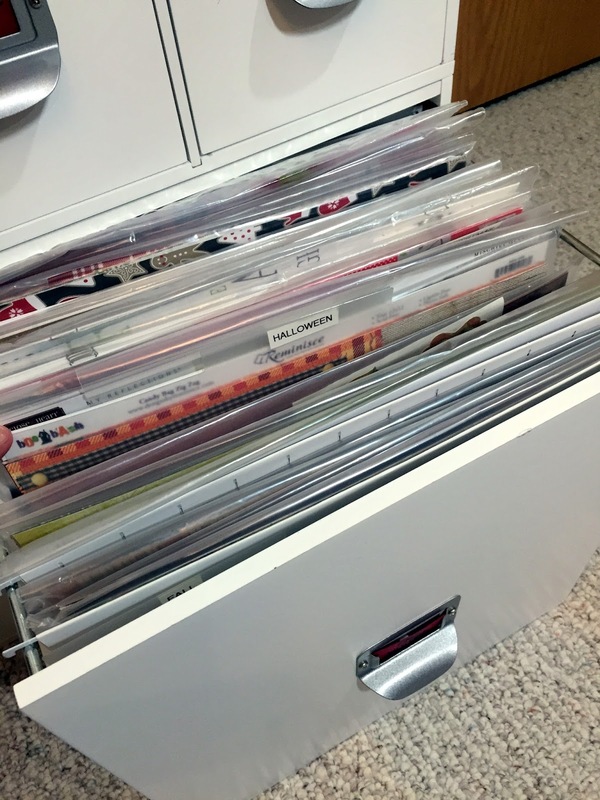 The lower level cubes in my cube wall are actually file drawers, outfitted with hanging file folders for 12 x 12 paper. I have one drawer organized by color for individual sheets I occasionally purchase from a bricks and mortar store, or that might be leftover from reeeeaaallly old paper packs. Cardstock: I keep my non-CM cardstock in stand-up paper holders inside one of my cabinets divided by size – 8.5 x 11 for cards and projects, and 12 x 12 for pages. I sort each size by color with neutrals first and the rest in ROYGBIV order. 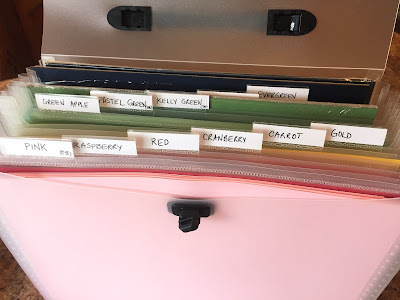 Because I sell my CM cardstock by the package and by the sheet at my crops and retreats, I need to be able to sort, store AND transport it easily, I have it placed into two Memory File Expandable Storage Cases. 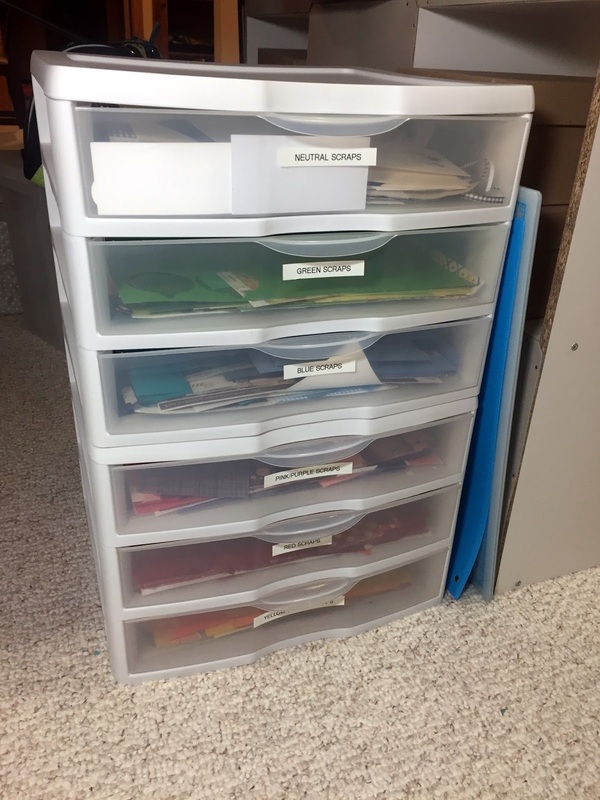 I also have them sorted by color order and labelled so I (and my customers!) can find what they need easily. The case keeps the cardstock free from rips and folds, and fits inside my larger rolling case for easy transport. Scrap Paper: Most of the time my scraps from a collection go back into their bag or Power Palette Folder, but if I’m using solid cardstock or other papers I’ll inevitably end up with scraps that can be used again. I don’t keep anything smaller than about 2" or 3”, and I trim away any loose or floppy ends so I’m dealing with more of a usable, rectangular shape. Then I simply toss it into one of my scrap drawers. 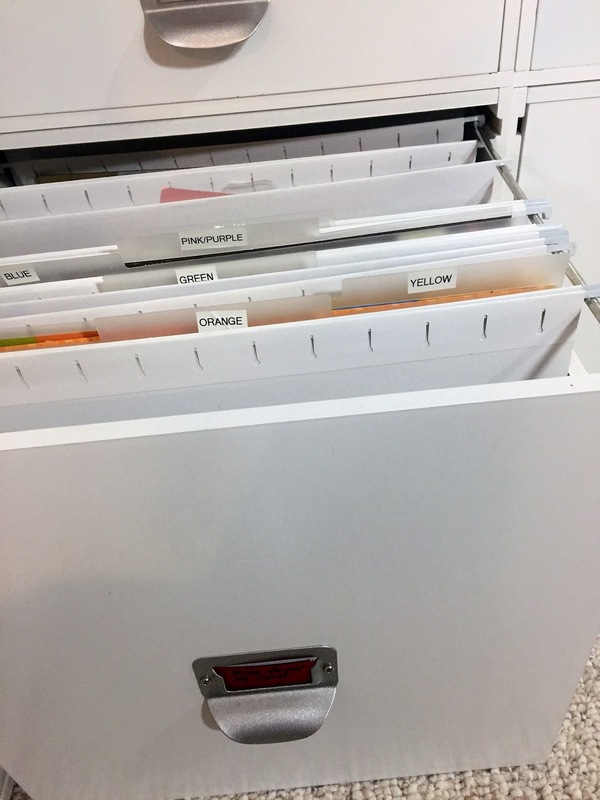 I use two stackable Sterilite Wide Drawer units which are labelled by color families – Neutral Scraps, Green Scraps, Blue Scraps, Pink/Purple Scraps, Red Scraps, Yellow/Orange Scraps - and are tucked under my scrap table. 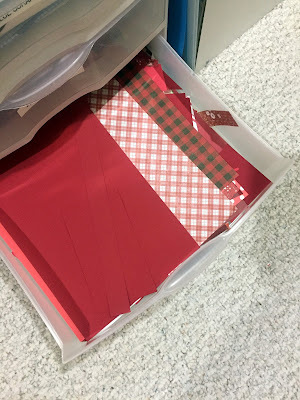 Whenever I need a small piece of a certain color, I know where to look...I dug into the red bin recently when I was gathering papers for last week’s Red & White Challenge! Perhaps more importantly, I have a place to put all the little scraps as I’m clearing off my table. Whew...that's a lot of paper! 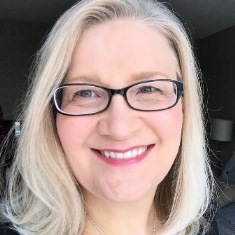 Hopefully some of these solutions will spark an aha moment for you, but don’t be discouraged if they don’t…you might need to try several options to find what really works for you. This is why I want you to share your comments – what works for me might not work for you, but it may work for someone else! How do YOU keep the paper monster under control? 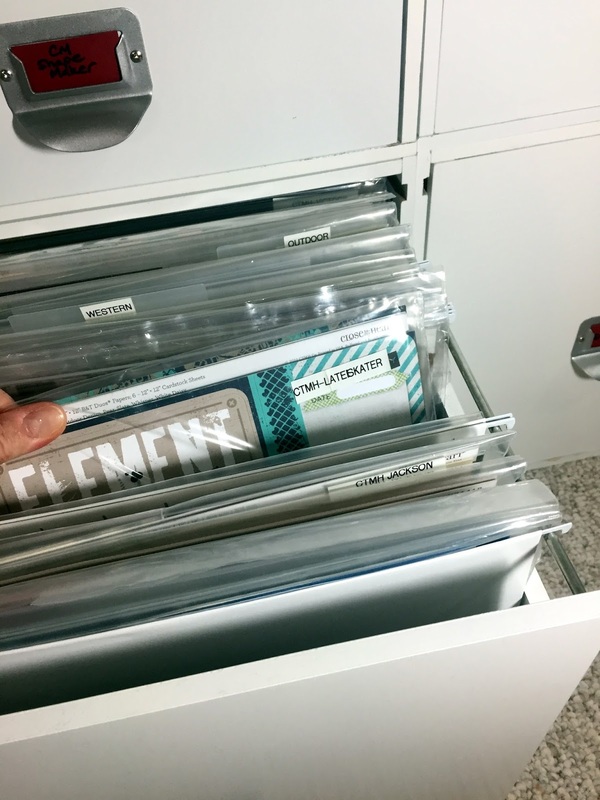 Please share your best paper organizing tips over on the OCM facebook page. Pictures are welcome for us visual learners, and make sure to use the hashtag #OCMOrganize so we can find your post or comment! Looking forward to hearing and seeing your tips! Love your organization. 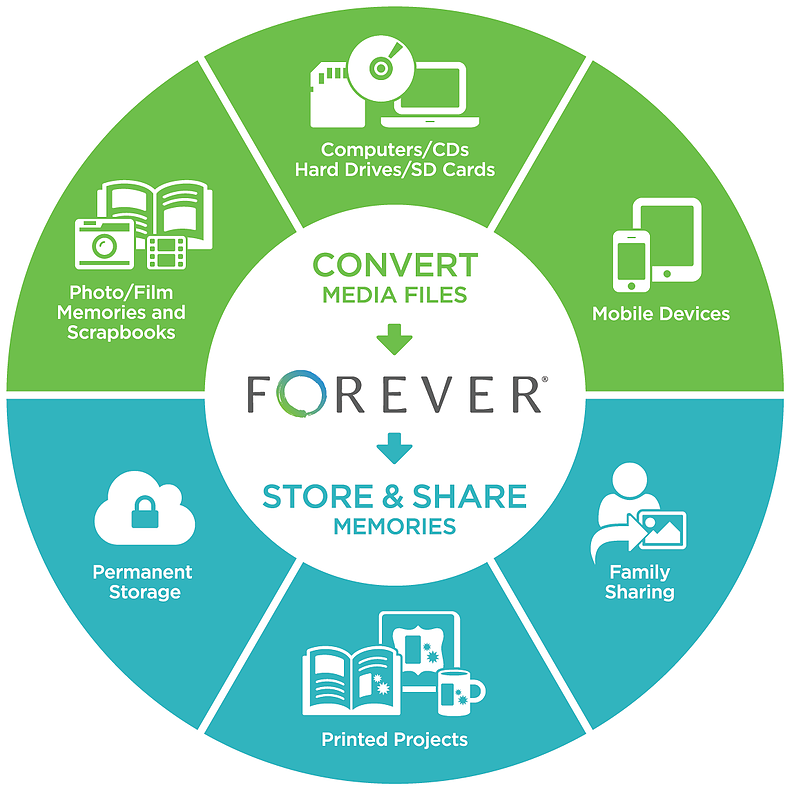 Looks very similar to Tiffany's scraprack organization system. Thanks for sharing your tips!